February 4, 2019 by Emily Brees Leave a Comment - This post may contain affiliate links. Two weeks in Costa Rica. 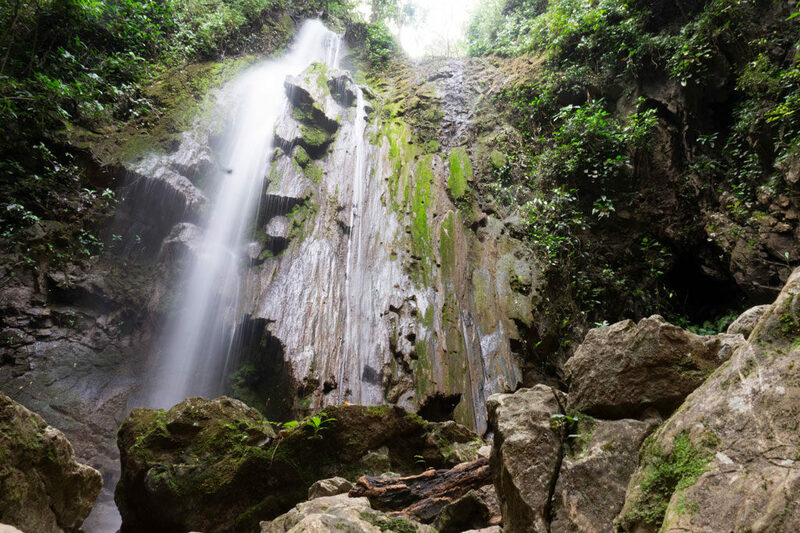 Highlights included enjoying traditional casado, jungle trekking, abundant wildlife, beach days, and coffee and cocoa plantations. A guide for all your travel planning! 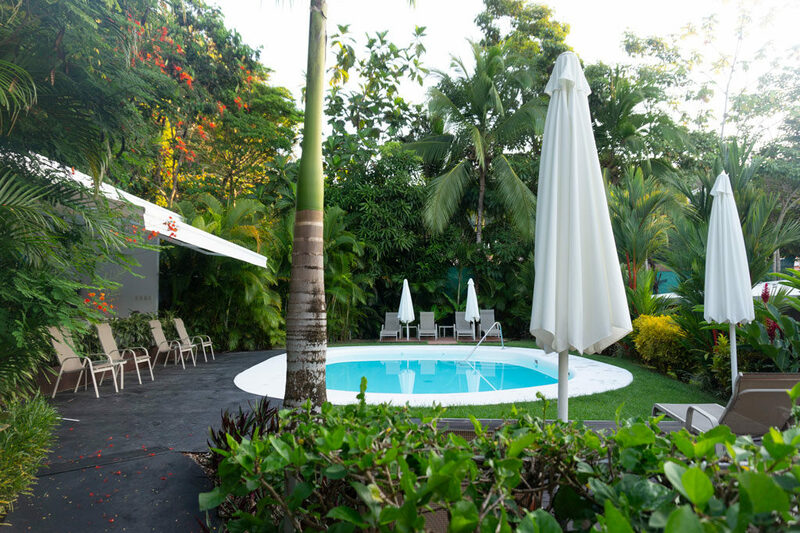 For the holidays this year, we warmed up in the tropical jungles of Costa Rica! 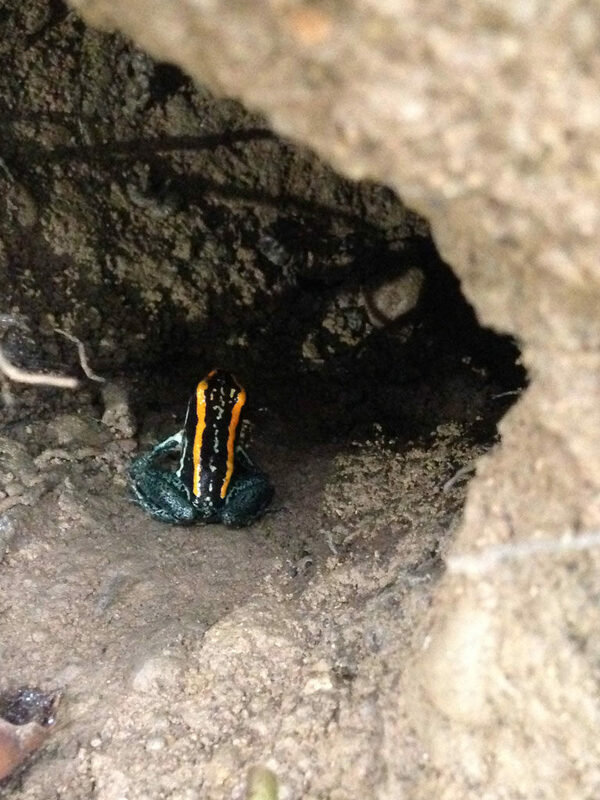 We had always wanted to visit simply to experience the biodiversity Costa Rica is known for. 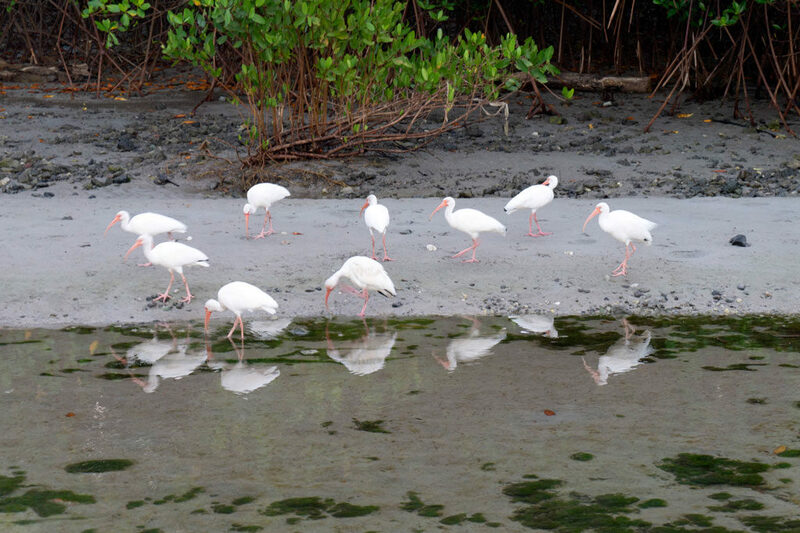 In fact, over twenty-seven percent of the country’s land has a protected status as national parks, wildlife refuges, and forest preserves…and that’s exactly what we found! Miles of undeveloped coastline flanked by thick jungle and monkeys everywhere. I can’t tell you how many photos of monkeys I took! 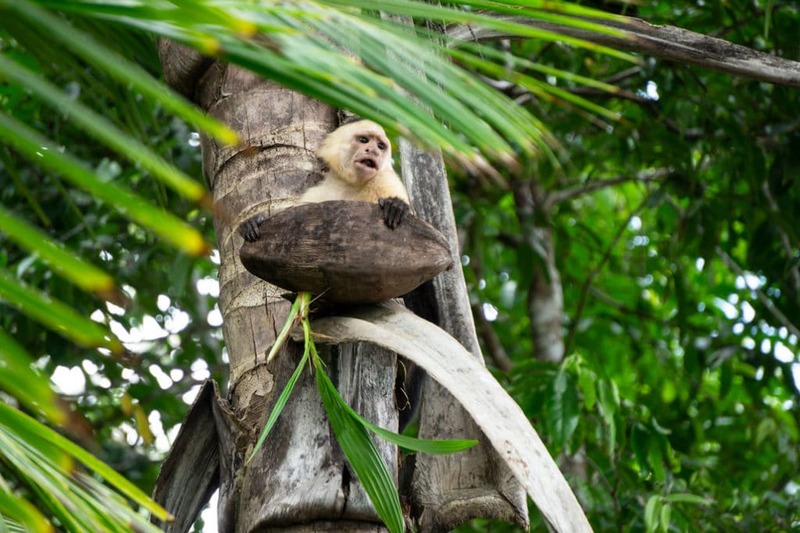 The capuchin monkey – sneaky little guys who love to steal items from sunbathers! Our vacation style is rarely the kind where you sit still. It’s usually only on the beach days that we manage to rest. 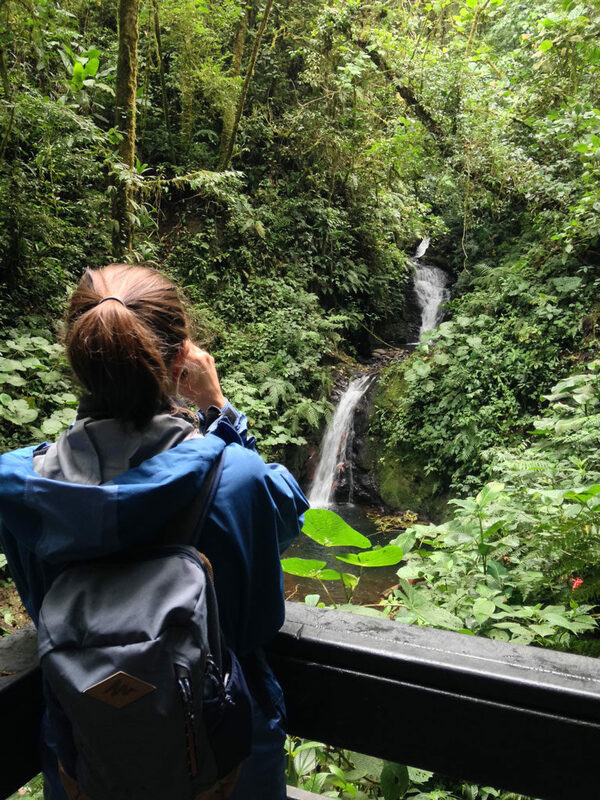 On this trip we started in the northern area of La Fortuna and Monteverde and skirted the western coast all the way down to the more remote area of the Osa Peninsula. 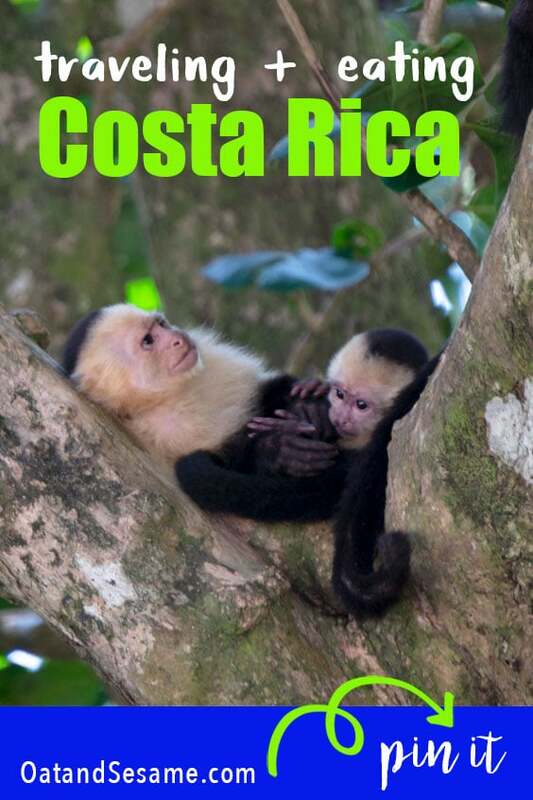 With more time, we would have visited the east coast as well, but travel across Costa Rica is slow! When Google maps tells you it will take 3 hours to go 130 kilometers in Costa Rica, believe it. The roads are winding with no shoulder, many roads are gravel, traffic is congested getting in and out of San Jose, there are zero street signs and definitely don’t drive in the dark. All that said, it’s definitely safe and fun to drive around Costa Rica! It gives you the ability to reach spots you might not be able to get to otherwise! We read reviews and rented through Adobe Rental Car – two thumbs up. We began our journey out of San Jose. Arriving in the later part of the afternoon, we knew we only had a few hours of daylight to drive to La Fortuna, our first stop. In retrospect, I would have spent 1 day, 2 nights exploring the food and art scene in San Jose. 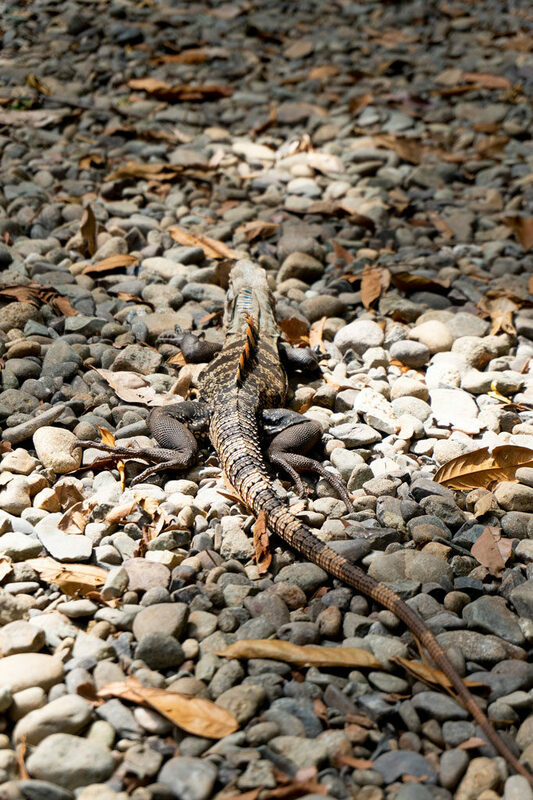 That would have made our arrival in Costa Rica less hectic – there’s my first tip for you! 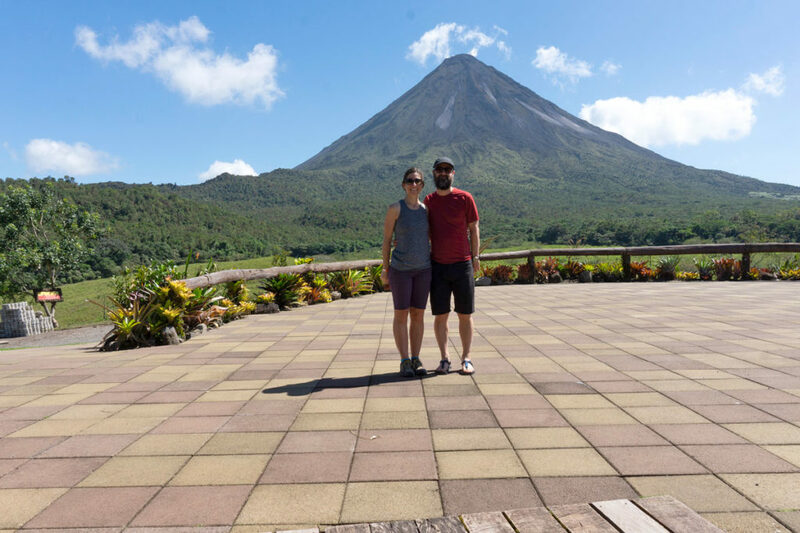 The first 2 days / 3 nights we spent in La Fortuna – a sweet little town right outside of the famed volcano – Arenal. Traveling in December is towards the very end of the rainy season, so we weren’t sure if we would see the top of Arenal, but it was clear as day, smoky steam emerging from the top. 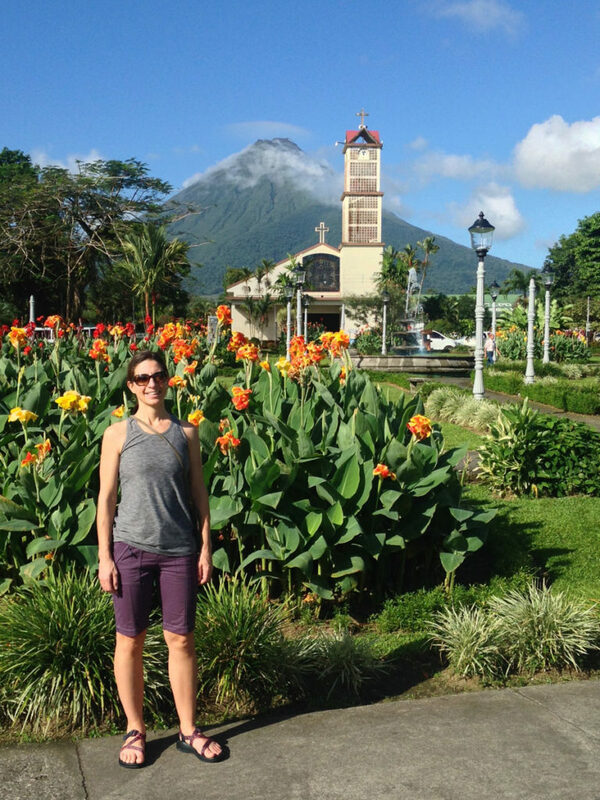 La Fortuna has a small main square with a few tourist shops on the perimeter. We stayed in an Airbnb a couple blocks off the main square and it was perfectly situated for walking to restaurants. 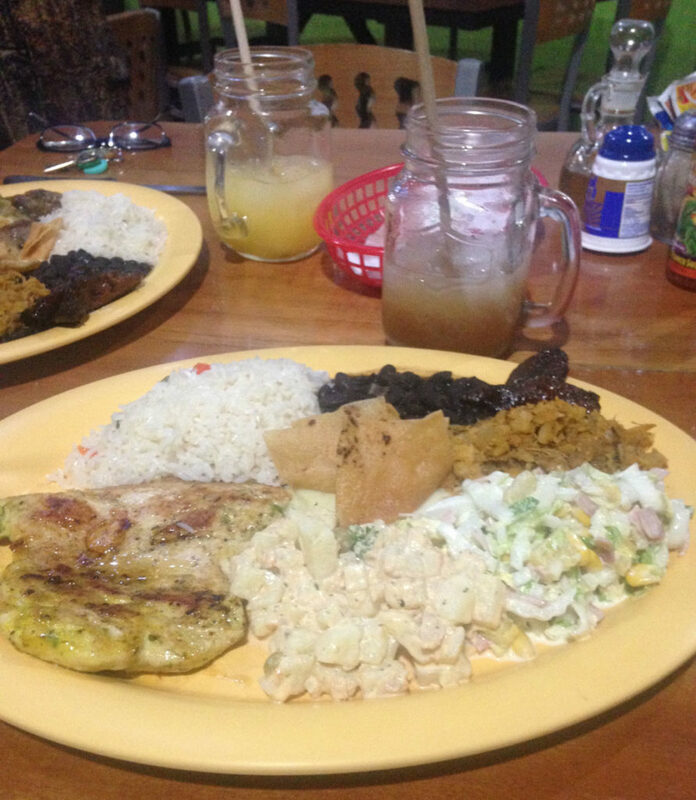 We ate delicious combinations of casado – which is basically a typical Costa Rican medley on a plate. 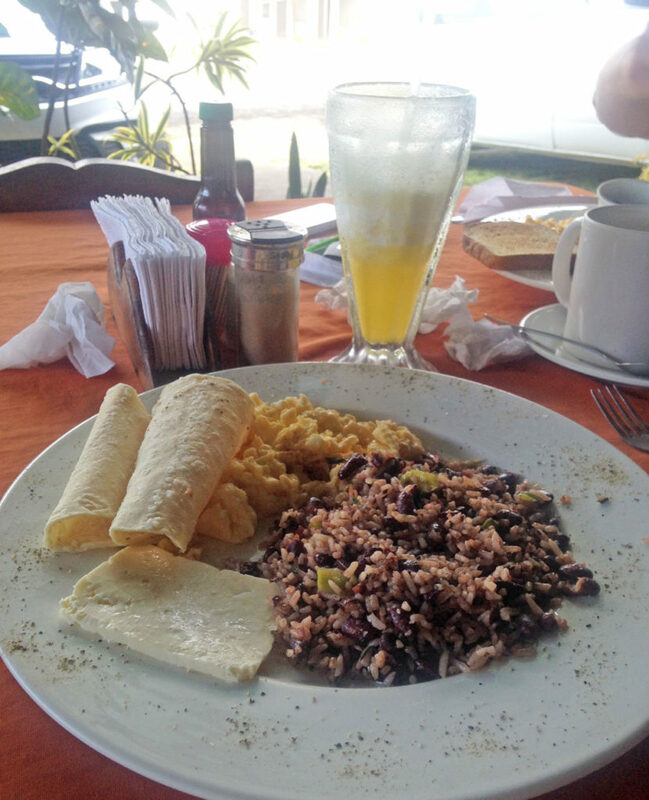 For breakfast it was rice + beans, eggs, a tortilla and delicious plantains – and DON’T forget the Tico sauce. (This sauce was so yummy we brought our family home a bottle to crack open for Christmas breakfast! It was gone so fast – thank goodness for Amazon!) For dinner it may be rice + beans, a meat, and a couple side salads. So satisfying. Outside of typical Costa Rican fare, there are some great options for salads, sandwiches, smoothies, etc. Fresh Dayz and Organico Fortuna are next to each other tucked a couple blocks off the main square. 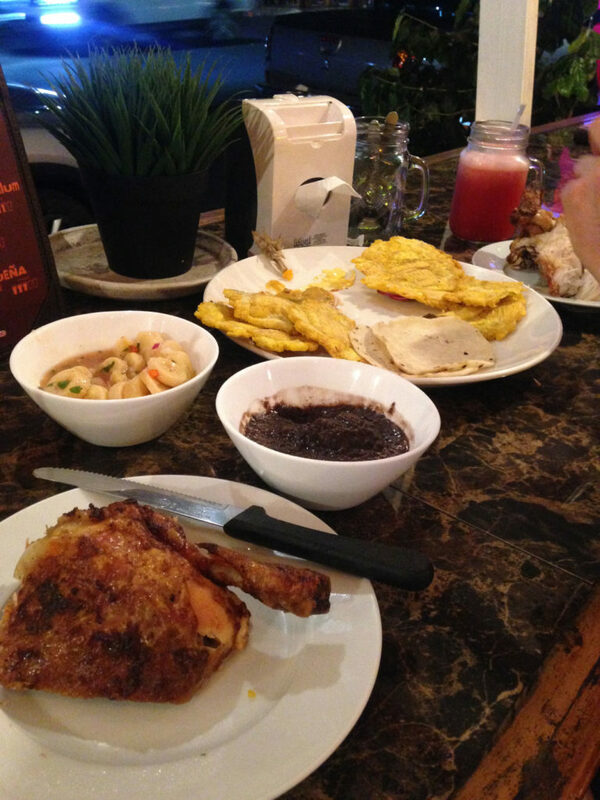 And at the suggestion of our Airbnb host, we headed to Pollo Fortuneño for roast chicken – twice! We chose to hike in a private reserve called Arenal 1968. A reserve named after the eruption of 1968 which sent lava flows across the western side. It’s a great place to view the lava fields. Hiking around the volcano I would classify as easy – short and pretty flat. This is where I saw our first howler monkeys – sleeping way up in the trees. Later, I would find out just how noisy they are! 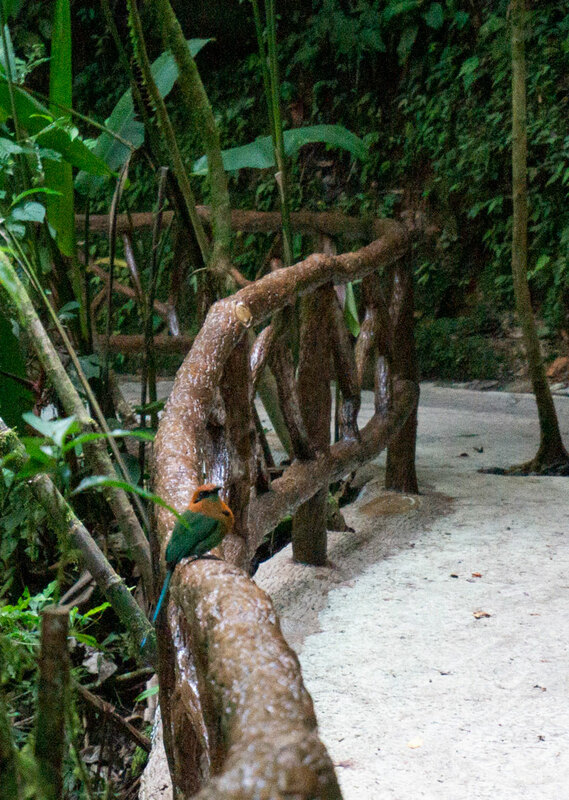 Since the trails didn’t take up the entire day, we also ventured over to Mistico Hanging Bridges Park. It kind of seemed like a racket, $26 pp to get into this private reserve, but we decided to risk it. We were pretty happy that we did! We saw monkeys take flying leaps from tree to tree, saw a saino (pig) and the mot mot bird. 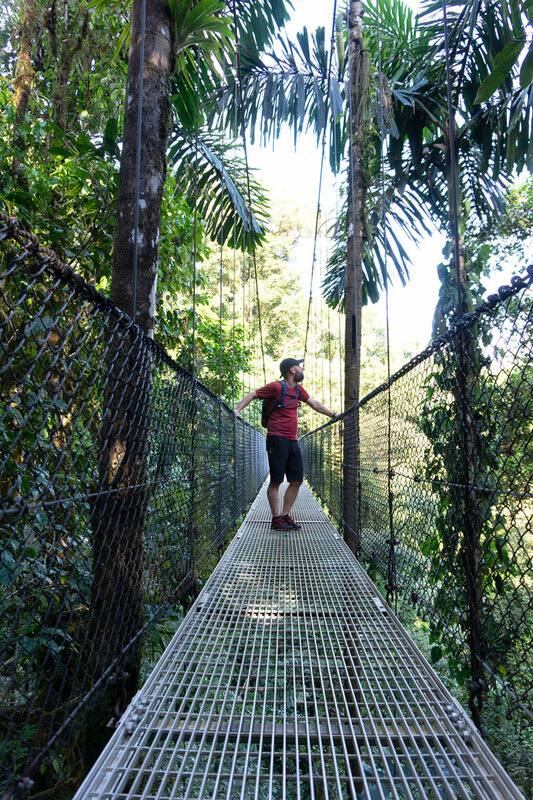 Plus the hanging suspension bridges brought your eye to all levels of the jungle, so it was worth it. Our second day was calling for rain, so we opted for a chocolate tour. Our guide was hilarious, we learned a lot and we scarfed down endless spoonfuls of molten chocolate topped with combinations of extracts and spices. Next on our route was the Monteverde Cloud Forest. Consistently covered in foggy clouds, this rare rainforest has always been intriguing to me. The drive from Arenal to Monteverde was winding and long around Lake Arenal, but it was gorgeous! 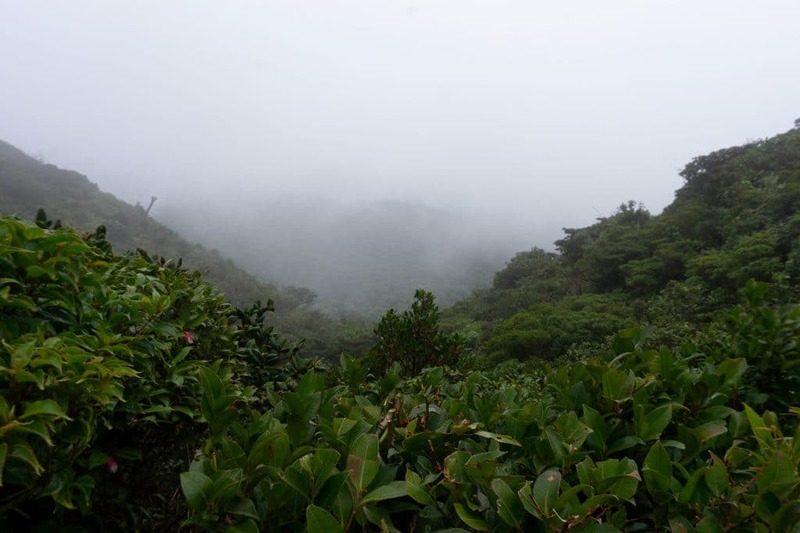 There are two cloud forests to choose from in Monteverde. 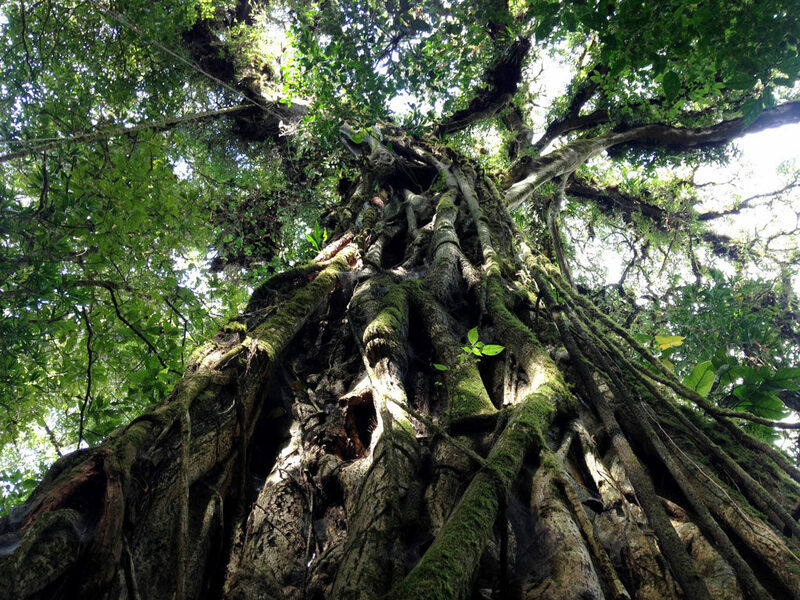 The Monteverde Cloud Forest Reserve and the Santa Elena Cloud Forest Reserve. 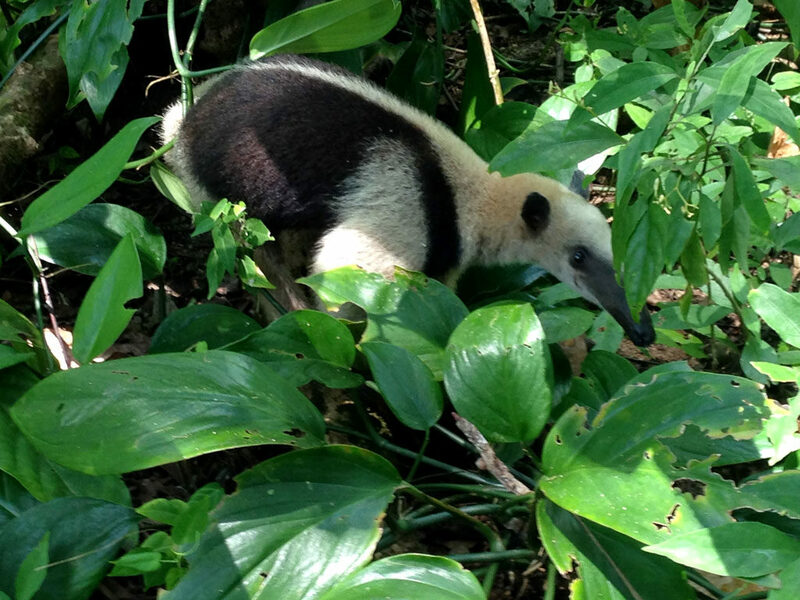 We went to the Monteverde reserve and also hiked near the Santa Elena Reserve. 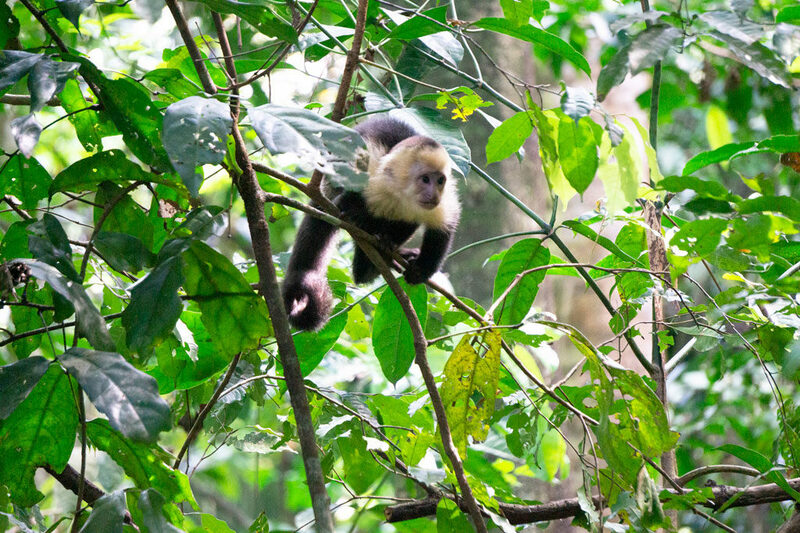 Honestly the two forests will give you the same experience – Monteverde has a windy overlook at the Continental Divide. The forest is super thick and it’s really hard to see any animals or birds without a guide. We did go without a guide and successfully found a caterpillar. Although many guides had spotted some interesting birds. 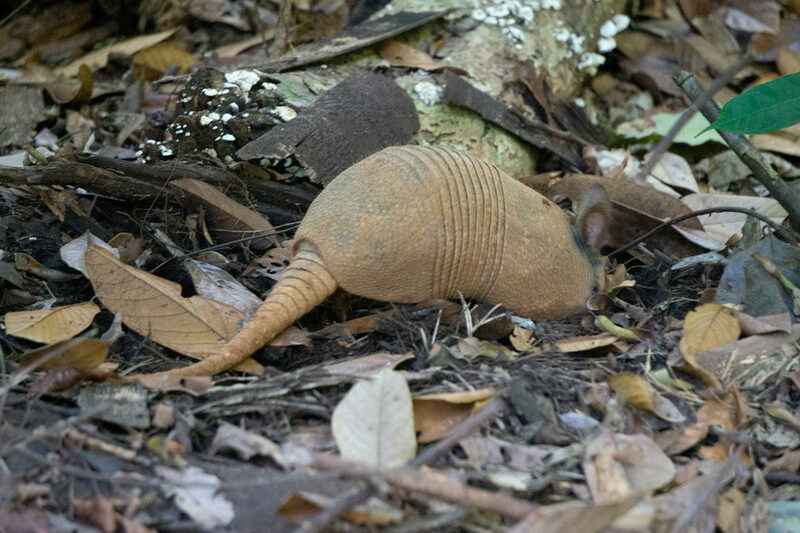 I’d recommend a guide at some point during your hiking adventures in Costa Rica – they can find animals and birds that you just can’t find on your own. Another really cool option we found after the fact, was the hike to San Gerardo Station with overnight at the station. Monteverde was surprisingly chilly and windy! Be prepared for that! 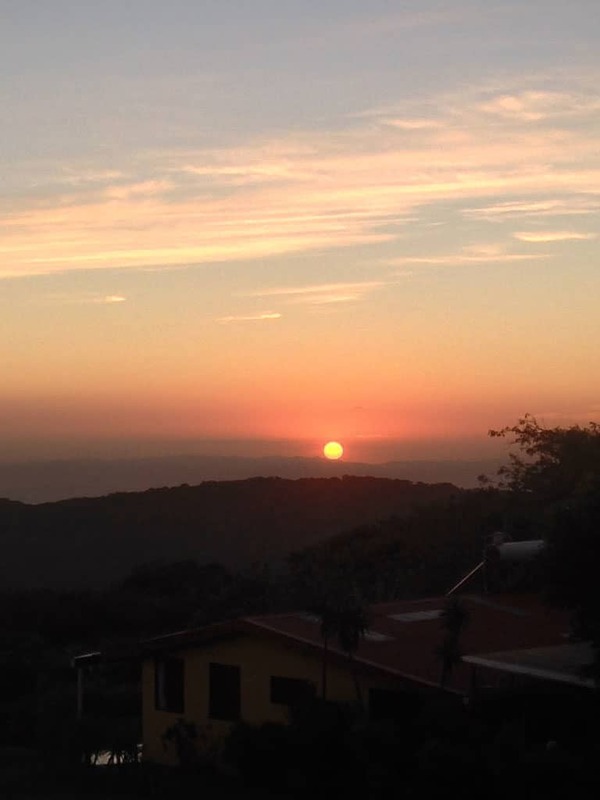 On our second day in Monteverde we went hiking and ate dinner at the cafe at the Monteverde Inn / Valle Escondido. They have their own private reserve for hiking and the best sunset views from their second floor deck. 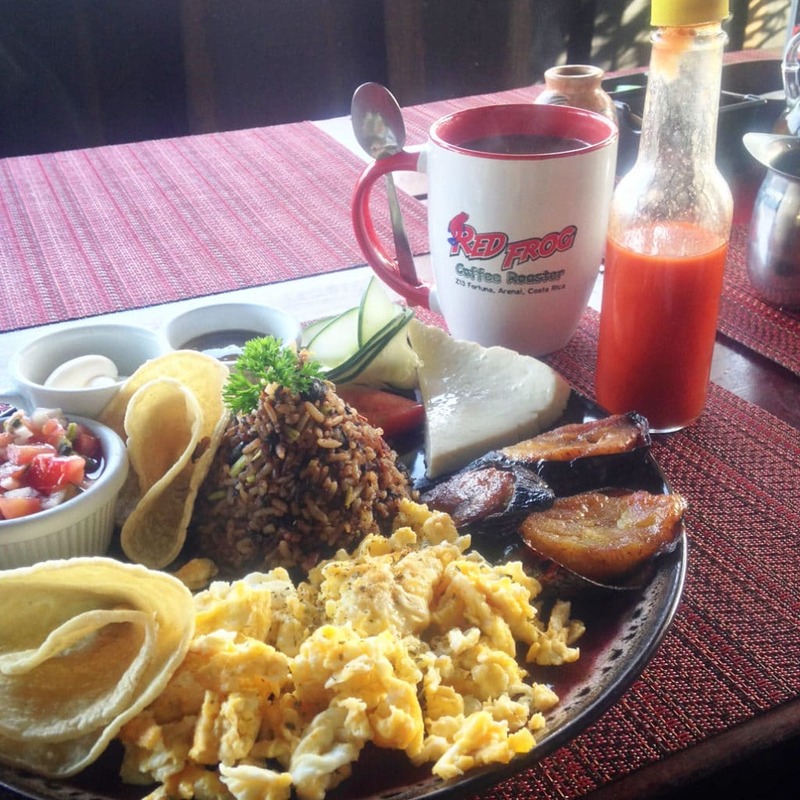 The food is simple, but you can’t beat the view to the Gulf of Nicoya. We wish we would have stayed there! 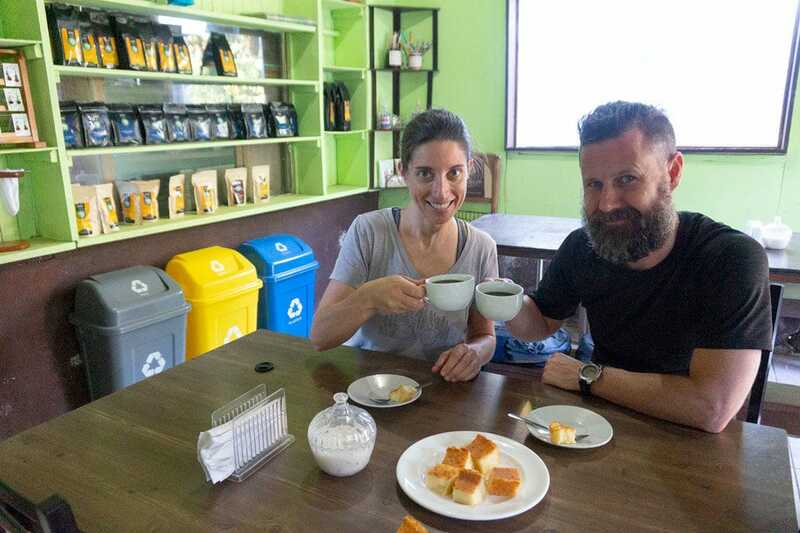 One of my top priorities for our Costa Rican adventures was to buy coffee – lots of it! We learned SO MUCH about the different ways to process coffee beans, how it is affected by climate change and how it can be more sustainable. 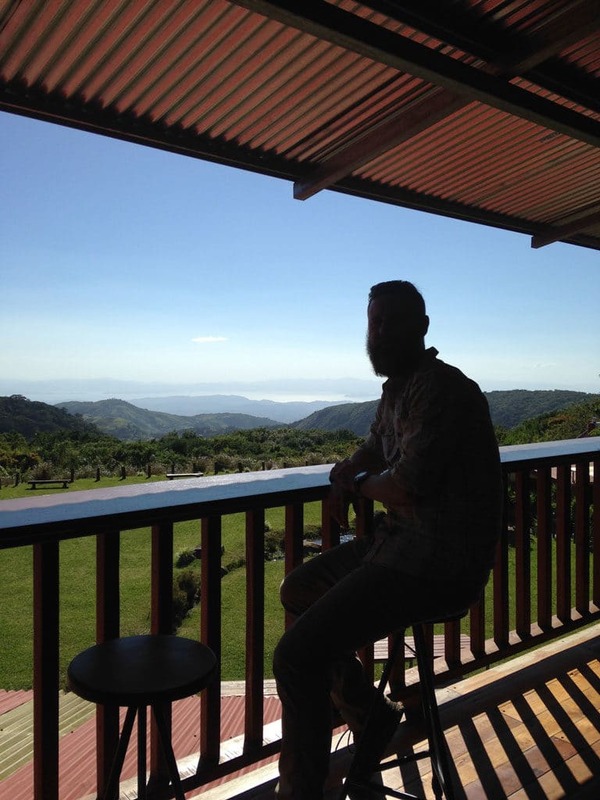 I highly recommend this small, organic family farm outside of Monteverde. 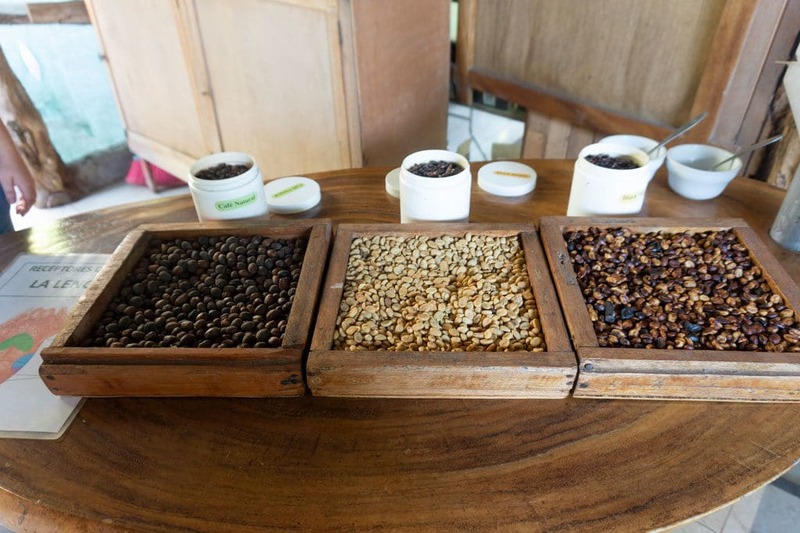 There are three different processes for coffee beans. 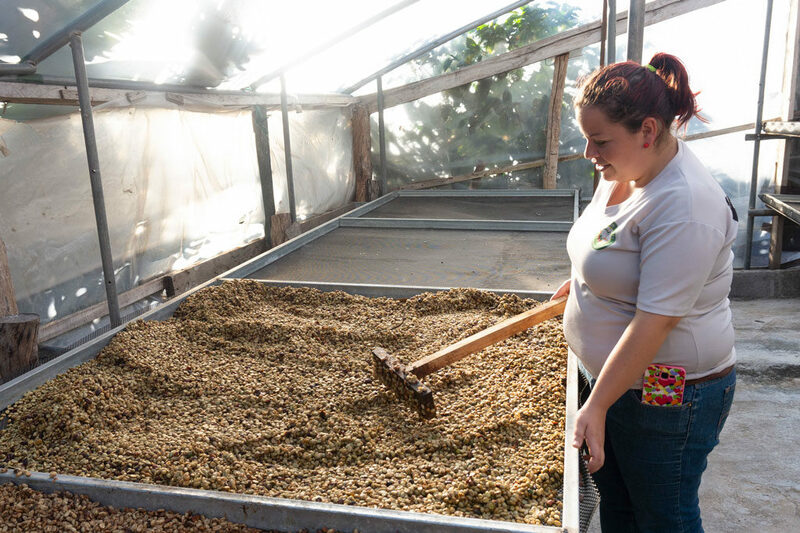 1) Washed Coffee – the beans are washed clean of all the sweet fruity membrane that they are housed in and then dried. You can imagine the immense amount of water that is wasted in this process. This is the way almost all coffee you see in the stores is processed. 2) Honey Coffee – the beans are left to dry with the “honey” or stickiness from the fruity membrane left on. The drying process takes a couple weeks longer and is more labor intensive because the beans must be stirred to prevent fermentation. Leaving the sweet fruit on the bean to dry makes the final product sweeter and saves water! 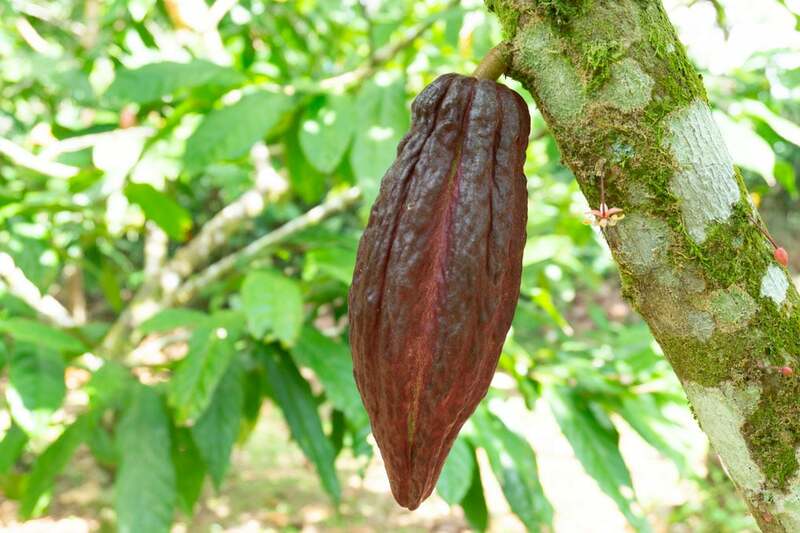 3) Natural Coffee – the beans are left to dry whole – skin, pulp and all. Again, the process takes longer, but the result is a sweeter coffee bean and no water waste! After days of chilling out (literally) in the cloud forests of Monteverde, we were super excited to get some beach time in. 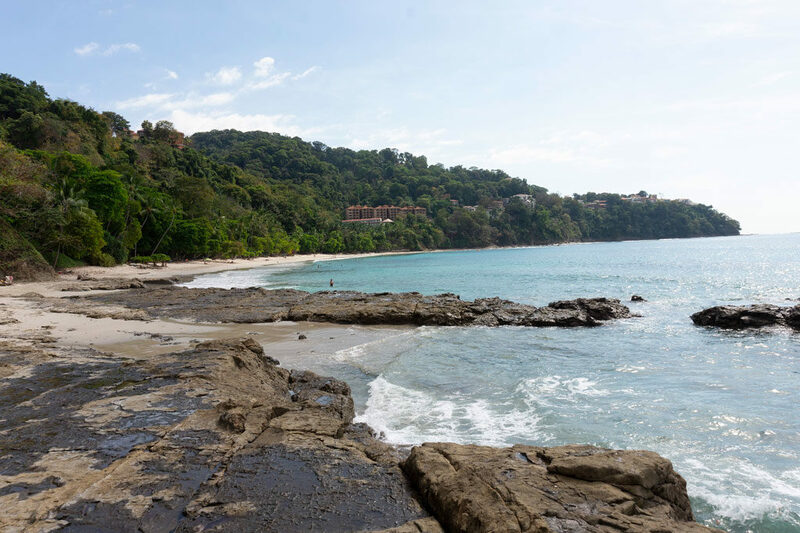 The drive to Manuel Antonio National Park was quite long, so I made sure to research a great beach at the halfway point on the drive. A little off the beaten path, but well worth the dirt road and small scramble over some rocks to reach the beautiful horseshoe sparkly blue beach. 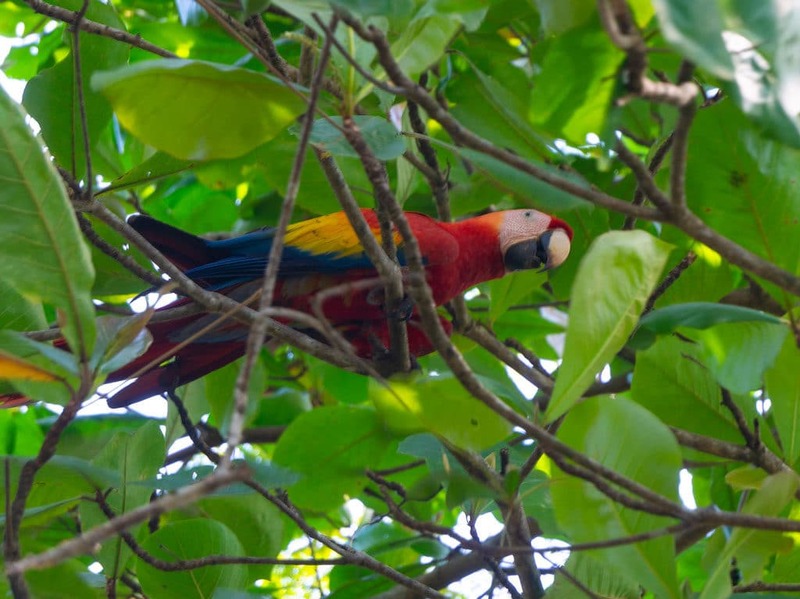 It was amazing to watch scarlet macaws fly over the jungle while floating in the clear blue ocean. Wish I was back there! We loved it so much we stopped again for a few hours on our return trip up the coast. TIP: to get to Playa Blanca, just follow google maps directions to Playa Mantas. 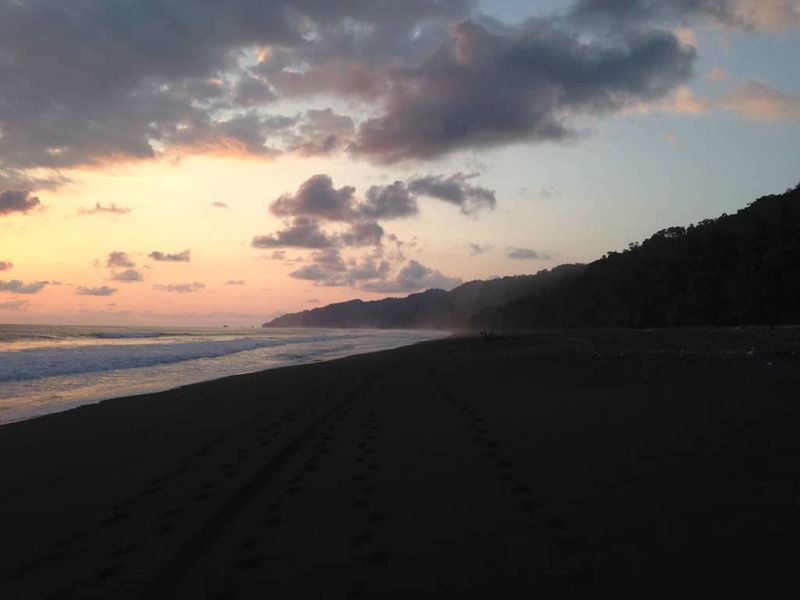 Since there are many beaches across Costa Rica with the name Playa Blanca, it’s easier to map Playa Mantas which you walk across to get to Playa Blanca. There is a well marked parking lot with attendants. Take a ticket and pay per hour when you return to the car. From Playa Mantas, walk all the way to the left over the rocks to Playa Blanca – just follow everyone else that is going the same way. Note it’s a bit difficult to cross the rocks during high tide – so time your arrival and departure. Bring snacks and water since there are no facilities. 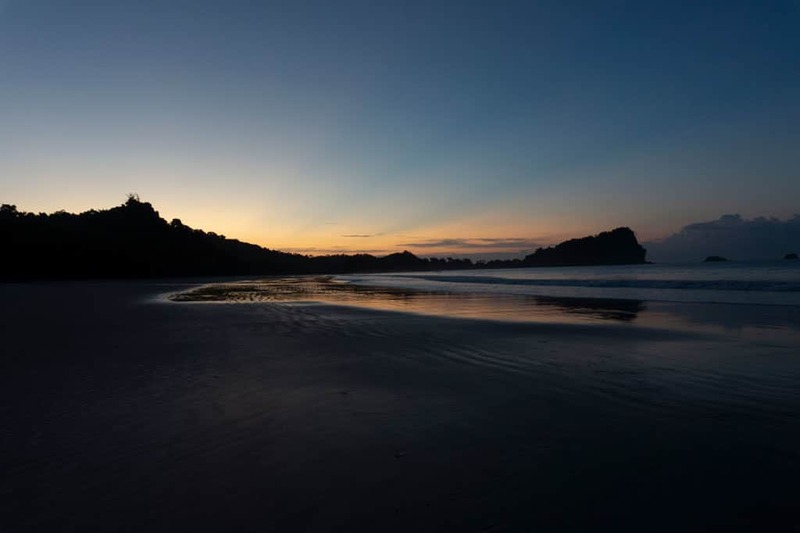 When we arrived at Manuel Antonio, we immediately wished we were staying longer. It’s such a cool oceanside town with windy roads and more touristy restaurants. It might have been that we were staying in a hotel with a pool and delicious breakfast. It was a touch of luxury that we hadn’t had yet in our trip. 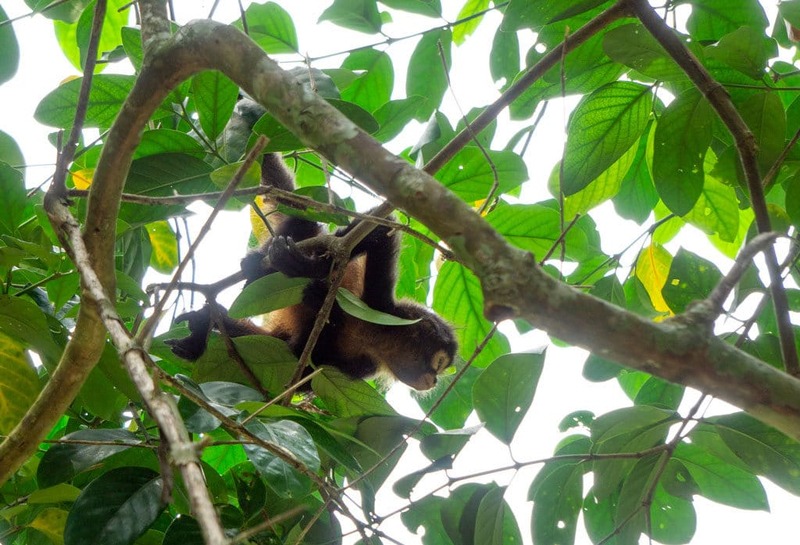 It was in Manuel Antonio that the howler monkeys were so loud in the morning they would wake you up at the crack of dawn. So we set out to catch the sunrise on Espadilla Beach. It was nice to be on this otherwise crowded beach with just a handful of people with the same idea. 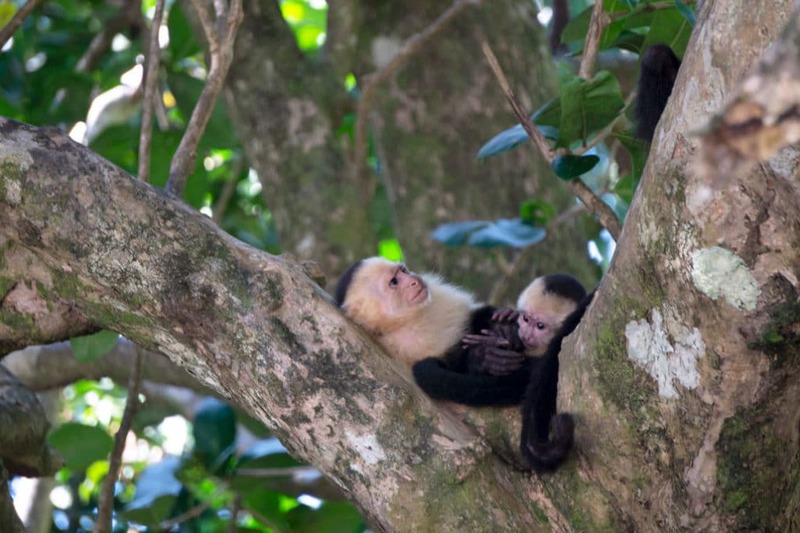 The national park was teeming with monkeys of all kinds – we saw Capuchin, Howler and Squirrel monkeys. Plus a lot of other animals and birds. 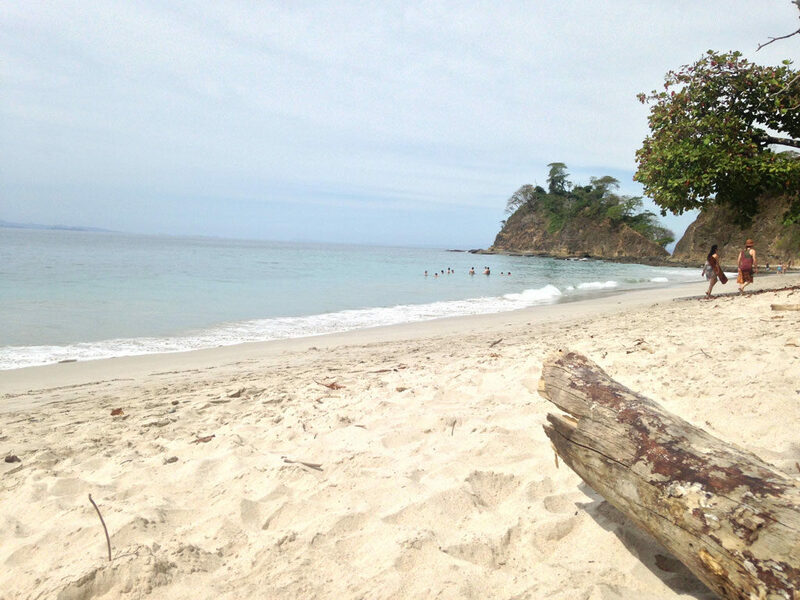 And Manuel Antonio Beach is gorgeous! TIP: You can’t bring any food into the park unless it fits specific guidelines. You can buy food at the one cafe in the park, but it’s not great. I’d recommend buying food from a vendor just outside the park before entering. 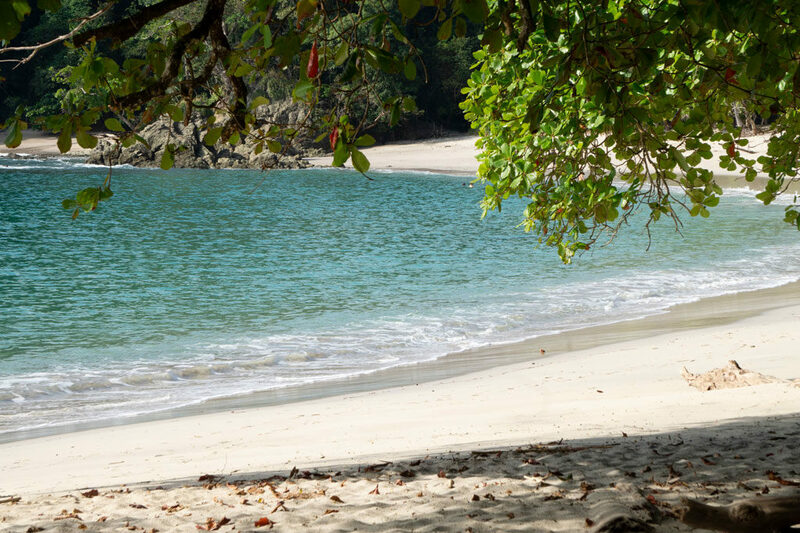 The monkeys really do try to steal everything on the beach – weigh down your bags with fallen tree limbs so they can’t get into your bag while you swim! After a full day at Manuel Antonio National Park, we were ready for some beach relaxation time. We found a beach on GoogleMaps called Secret Beach, so we decided it was necessary to check this beach out too. It wasn’t quite so secret, but definitely beautiful and peaceful in the morning. Arrive in the morning, park along the road, walk down a path between two small metal fence posts and you’ll have the beach to yourself. The final stop on our trip was driving all the way south to the Osa Peninsula. 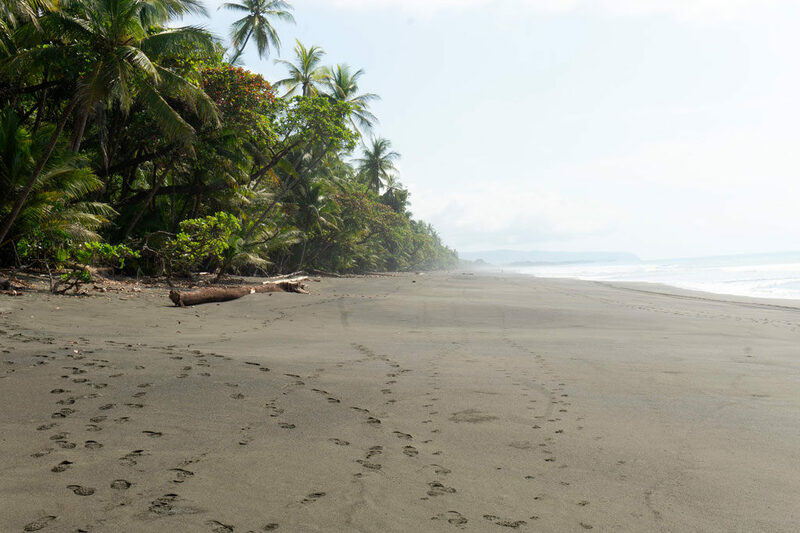 It’s home to nothing but ecolodges, remote beaches and the unspoiled wilderness of Corcovado National Park. The Osa Peninsula is quiet. There is no cell service. Just unspoiled natural beauty all around. 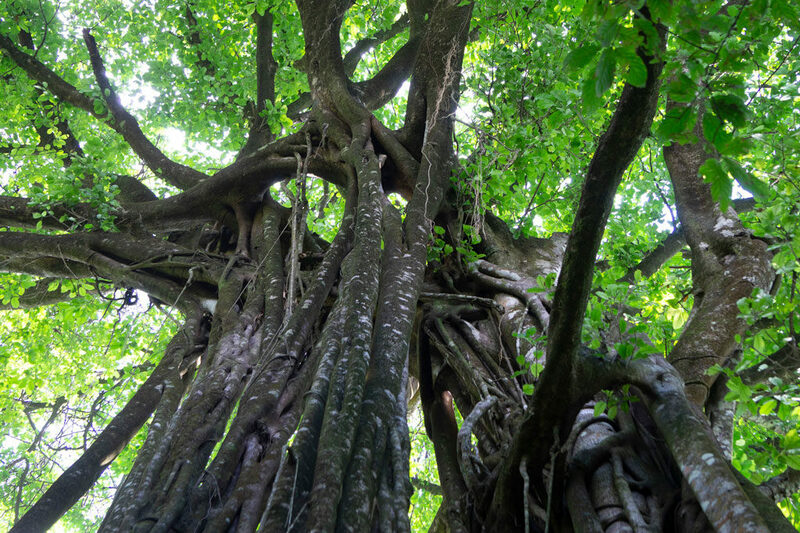 With options for some multi-day jungle trekking, Corcovado National Park is for those who really want to get out into wild nature. 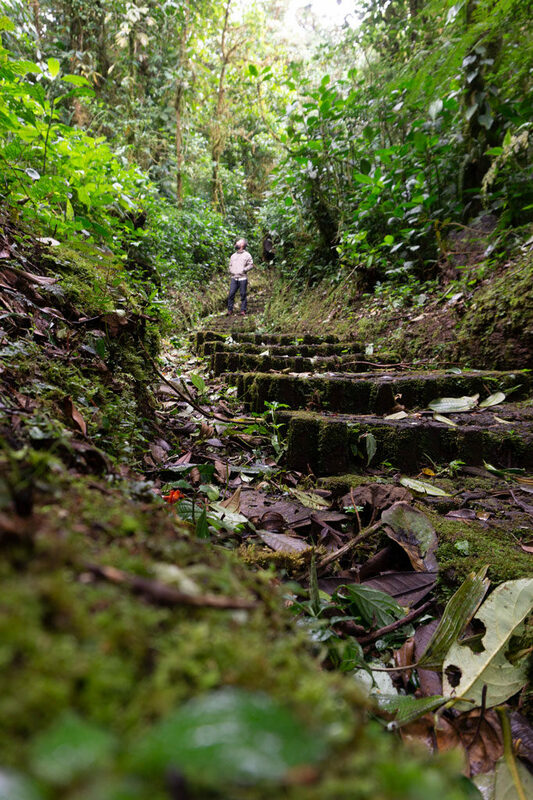 Guides are required for any hiking in Corcovado National Park. We didn’t have time for the multi-day treks, but managed a 10 hr hiking adventure with Rodolfo from Corcovado Hiking Tours. 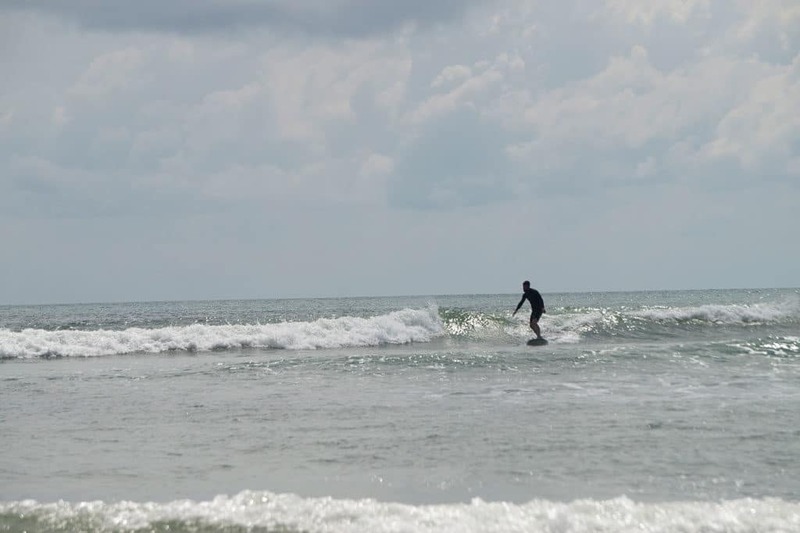 My husband “tried” (notice I said “tried” a surfing lesson with Pollo’s Surfing School. It was a great lesson; however, the ocean sent him back to the beach rather quickly. Our Airbnb was as close to sleeping in the jungle as we could get. It was open air luxury with mosquito nets. With that we also experienced some not so luxurious things like the giant Costa Rican cockroach which was enormous and determined to return to visit two nights in a row despite being vigorously swept away twice. I’ll spare you the photos. Google it if you’re curious. 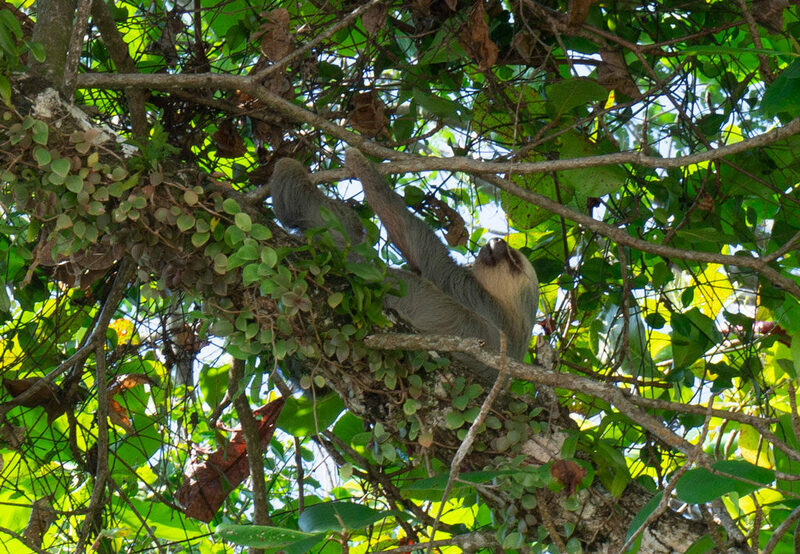 Moving to jungle creatures that are more pleasant, we saw so many new animals while hiking in Corcovado – anteaters, coati, toucans, frogs, scarlet macaws, tent bats and of course, monkeys. On our hike, a monkey purposely pooped on one of our other trekking mates from the trees above while we were passing through. Monkey business for sure! 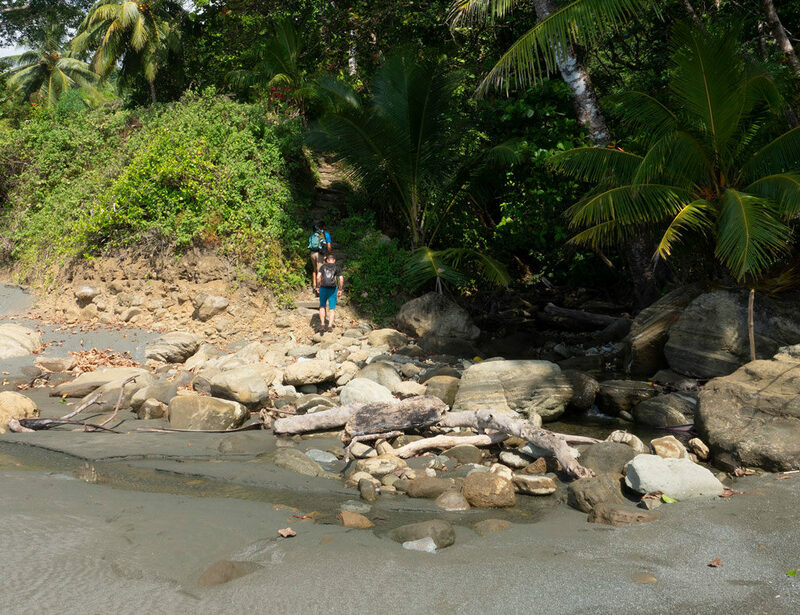 On our last day in Corcovado, we choose to find our way to the King Louie Waterfall at the end of the peninsula. Our Airbnb host gave us detailed directions that are necessary since there are no road signs. We didn’t think we would actually get there with all the twists and turns required. 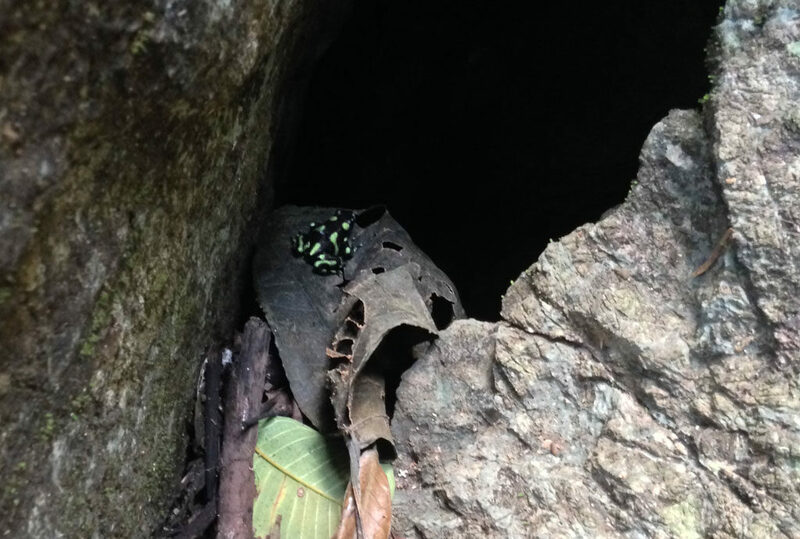 It was some intense off roading for our SUV, but we managed to get through and find ourselves at a beautiful waterfall and I saw this little frog tucked in a rock! Anyone renting a car in Costa Rica needs 4 wheel drive. Especially on the Osa Peninsula. We went through many water crossings which were exciting; however, there was one crossing that was determined to take our license plate off. We had to check every time we crossed this one to make sure our plate was still attached. The final drive through on the last day sent it floating downstream, but we caught it! 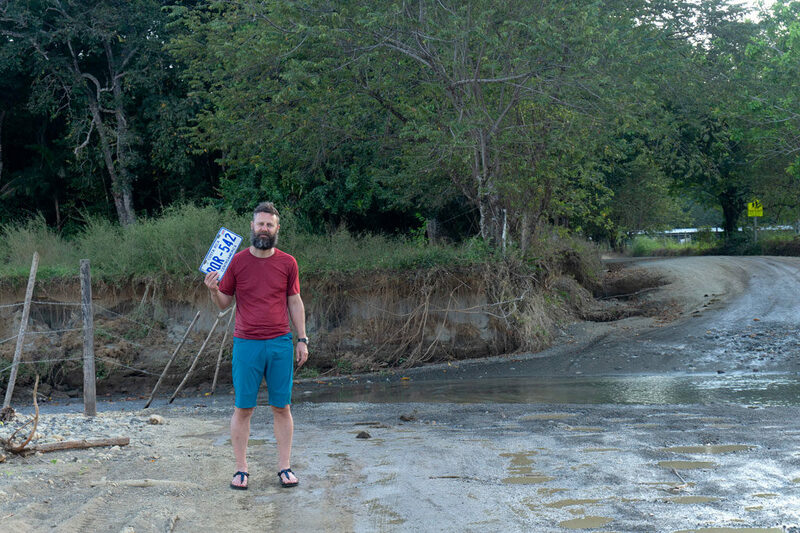 Go figure – it was just another bout with license plate problems while traveling – read our Mexico license plate story here!